Print & Digital: Complementary Strategies? Print is dead? While this may have been spoken about for some time, the truth of the matter is that while print numbers are in decline, they still represent a significant amount of revenue for publishers. Working in partnership with some of the leading media companies around Europe, MPP Global has a clear understanding of how publishers can complement their print and paid content strategies to maintain and grow revenues and subscriber numbers, especially in light of ad blockers. Offering customers a bundled subscription is a popular choice for publishers wishing to protect and maintain print circulation, especially with numbers declining. By including both print and digital services within the subscription, companies are able to offer print content at a lower rate while also increasing digital sales. The Financial Times is one publication which offers customers the choice between a Standard Digital, Premium Digital, Print only or Newspaper + Premium Digital subscription. This combination is over £5 cheaper than purchasing the Premium and Print only subscriptions individually and has helped the publication reach a gross audience of over 540,000 in the UK. Offering this model as a choice enables publishers to reach a range of audiences and presents an additional revenue stream outside of advertising and solely print or digital subscriptions. Vouchers are a crucial tactic for both growing acquisition and rewarding loyal customers. Bearing this in mind, using marketing tools you can create voucher and reward codes which, for example, can be featured in your print services offering a week’s discount to the digital service. As well, publishers could create a voucher to become a digital subscriber with 6 days online access and a printed Sunday edition, encouraging consumers to use both services. Publishers who have leveraged this tactic of rewarding its subscribers include The Daily Mail, who features its MyMail rewards in newspapers for its members to collect the codes and deposit on their MyMail account with access to a choice of rewards and promotions. MyMail currently has over one million people signed up to the service. Leveraging marketing tools to create voucher and reward codes enables publishers to encourage current consumers and subscribers to interact with the other services available, helping to develop acquisition and grow revenues. For the publisher it is vital to have a centralised view of your subscribers across all of the services they use and/or pay for. Unifying print, digital and all-encompassing subscribers within one platform enables the organisation to centralise important information, garnering a holistic view of behavioural, customer and revenue data. This ensures services can be improved based on this information, vouchers and rewards can be targeted effectively, helping to streamline operations and potentially keep subscribers using the service. What can be established from the publishing industry is that while print still plays a dominant role in businesses acquiring revenue, strategies should be unified, with print and digital working together and all subscriber information becoming centralised to effectively understand audiences and improve services and business decisions. 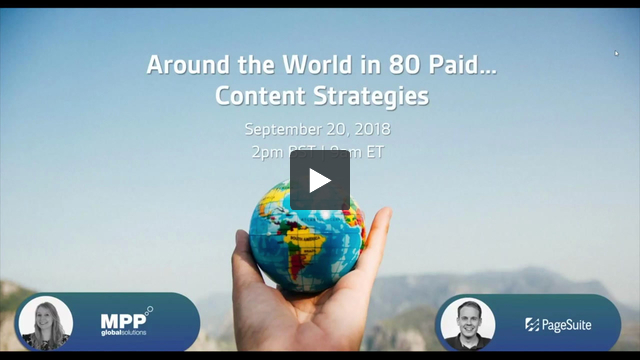 Our VP, Media & Publishing, Ana Lobb and PageSuite Business Development Director, Ben Edwards joined forces in a co-hosted webinar to present a selection of paid content strategies and products from unique international markets, such as Africa, South America, Eastern Europe, Asia and the Middle East, to see how these stack up against the likes of North America, Scandinavia, mainland Europe and Australia. Are you looking at how you can develop new and existing strategies to grow revenues across print and digital? Let’s meet at the World Publishing Expo in Vienna, where we will be discussing useful hints and tips around strategy and best practice to maximise conversions. Come by the MPP Global stand (Stand C.674) where we will be demonstrating successful client case studies and industry insight.